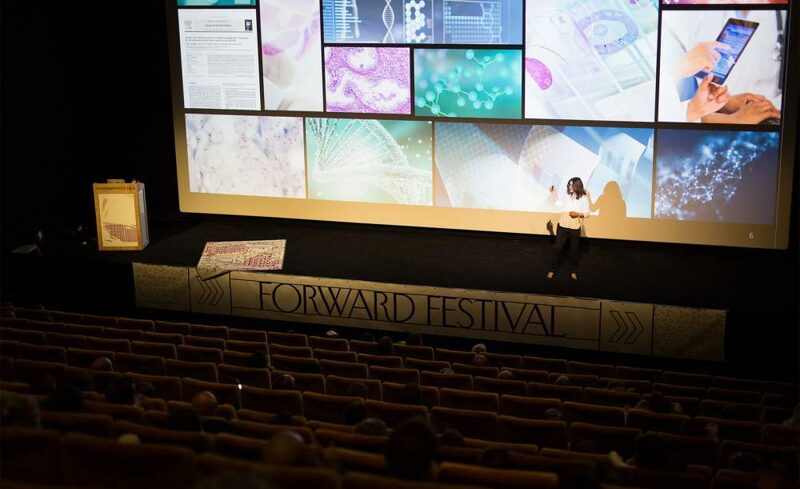 At this year’s Forward Festival in Zurich, two unlikely things were brought together a little bit closer, namely healthcare and design. 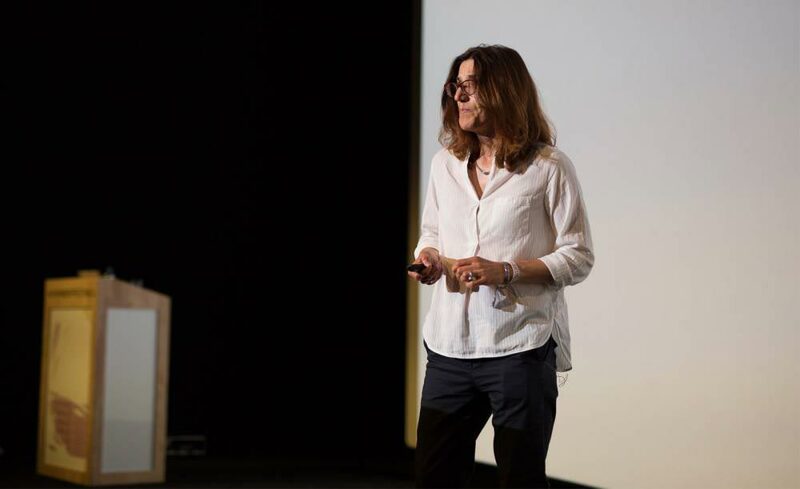 Elina Koletou, who filled in for Marianna Rapsomaniki last minute, and Maria Gabrani from the IBM Research Lab held an AI science slam about the usage of artificial intelligence in healthcare. Both of them are doing research in the field of health-related AI and work at the IBM Research Lab in Zurich. Maria Gabrani at the IBM AI Science Slam. Marianna Rapsomaniki proved in her previous research that unlikely pairings can lead to great results. Delivering packages and biology for example. Among other things, Rapsomaniki studies cell cycles and the lifespans of cells. By working together with a researcher who specializes in supply chain optimization, they were able to develop a cloud-based technology to study single cells called CellCycleTRACER. This algorithm does not care whether it is sorting mail by zip codes or cells based on where they are in their life cycles. Using AI in healthcare means taking advantage of software and algorithms in order to facilitate the analysis of complex medical data. While it might be widely perceived that this will lead to patients being treated by robots or machines, that is absolutely not the case. Artificial intelligence should free up more time for healthcare providers to actually give each patient the care they need. Maria Gabrani during her talk. 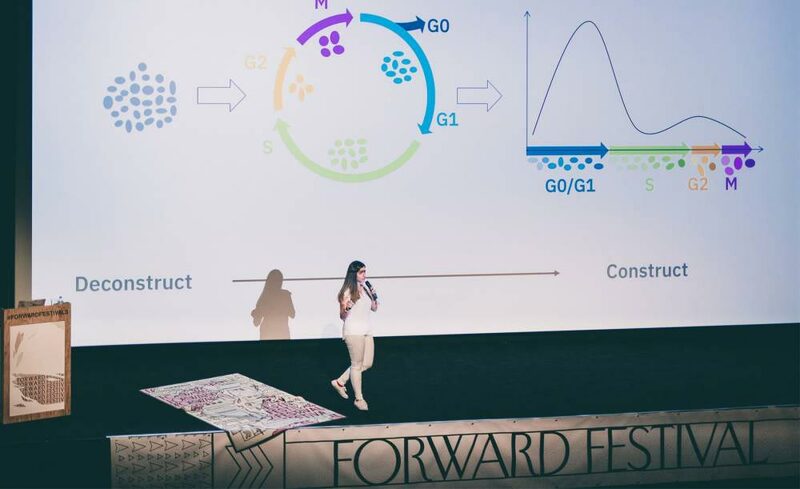 At a first glance, the IBM Research Lab and the Forward Festival might seem like one of these unlikely pairings but as Elina Koletou and Maria Gabrani showed, they go together astonishingly well. Koletou even incorporated this year’s festival slogan “Construct – Deconstruct”, because cell cycles are nothing else than the construction and deconstruction of cells. Elina Koletou explaining cell cycles. Creatives deal with this cycle of creation and ephemerality, construction and deconstruction, on an everyday basis. In the course of the creative process one creates various prototypes, which may never become a mature product. Like cells, creatives have to reinvent themselves every time they start a new project. So maybe there might be more to learn from our good old cells than we would have thought.